Make sure to RSVP via G+ Hangout Here or watch the interview live on the YouTube Channel Below. 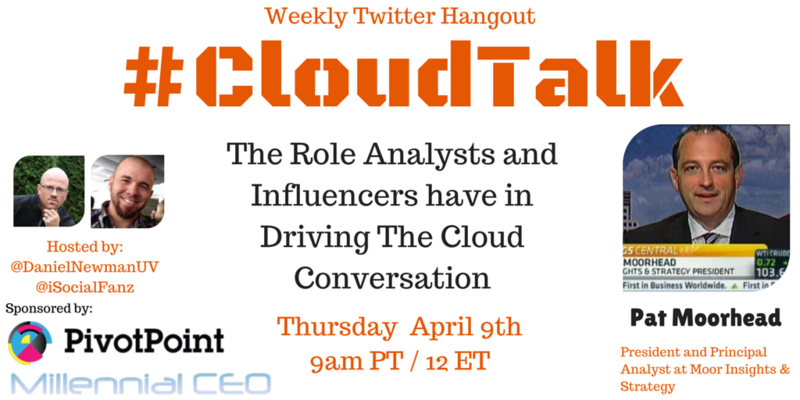 As always you can join the conversation on twitter during the live broadcast using the hashtag #CloudTalk to answer the questions, submit your questions for the guest or simply engage and learn from the community. Patrick Moorhead was ranked the #1 technology analyst in the U.S., Europe, and the U.K. by Apollo Research in January ’14 and is one of the most cited technology analysts in the world. He has been recognized in publications like the Wall Street Journal, Computerworld, Recode, USA Today, Barron’s, Marketwatch, CNBC, Reuters, Bloomberg, VentureBeat, PCMag, ZDNet, CNET, PC World, EE Times, CRN, ABC, BBC, San Jose Mercury News, Austin American Statesman, and many more.